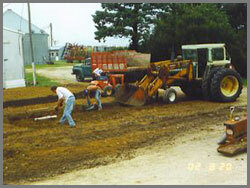 This was the beginning day of court construction on July 12, 2002. 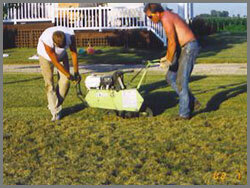 Mason Kuhn and Mark are shown cutting sod on the 9,000 square feet of the court's surface. You really had to "believe in the dream" at this point of the project. In the words of Korczak Ziolkowski, the famous sculptor of the Crazy Horse Memorial, "Never forget your dreams." 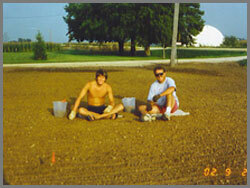 Alex Kuhn and Mark are pictured on Labor Day, 2002 gathering buckets of small rocks immediately prior to seeding the court. It took a full year after seeding to get the bentgrass fully established before play began. We are very thankful to all our friends who helped us with many parts of the project. Special thanks to Virgil Burns, Ed Brown & Marilyn Jacobs, the Dave & Marilyn Dolan family, Frank Rottinghaus, John Nedtwig, Jason Jepperson, Val, Zach & Mike Rye, and Schafer Bros Tiling Inc.
Lines are painted once a week using an aerosol latex paint machine. (It's one of Mark's favorite jobs!) The lines are either mowed off or they fade due to rain. But that's OK, because "rain makes grain" and sustains the corn and soybeans and bentgrass grown on the Kuhn family farm. Mark is shown raking soil into the drainage tile ditches on the court. 17 truck loads of sandy soil were hauled in to supplement the former cattle feed lot, an irrigation system with 17 sprinkler heads was installed, and 700 feet of drainage tile were trenched in to drain excess water. 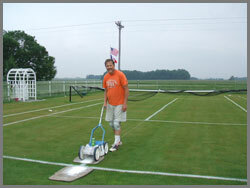 It was a "labor of love" making the 628 pickets that line the single grass court at the AILTC. The pickets were individually cut with a jigsaw, sanded, primed, and painted white on one side and green on the other. 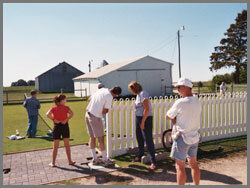 The picket fence was designed to give the court the look of an English garden. 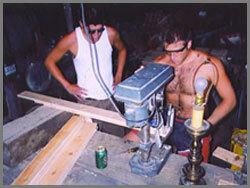 Mason and Alex are shown working long hours in the wood shop. 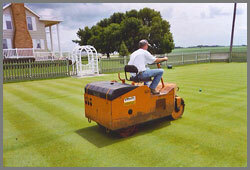 The lawn is mowed at least every other day at a height of 7/16", a job that takes 45 minutes. 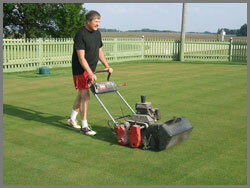 Mark mows the lawn in four different directions to give the grain of the grass a "checkerboard look." The court is rolled on occasion with this two-ton, self-propelled asphalt rolling machine. Rolling makes the court firmer and results in a more consistent bounce. We still get our share of bad hops or "greenies," but that's just part of the challenge of playing on grass.